Food is a basic need, and as it relates to sustainability, it is the core concern, according to Sasikumar Balasundaram, PhD, assistant professor in the Southern Illinois University Edwardsville Department of Anthropology. Balasundaram, who began working at SIUE in August, is a native of Sri Lanka. It was his humble beginnings in a small tea-growing community that sits 4,143 feet above sea level, that Balasundaram said has caused him to be a champion of food sustainability. While he does not think the food system in the U.S. is as dire as it is in Sri Lanka, Balasundaram believes that there are some serious food concerns in America. Balasundaram, who has been in the country for 10 years, cooks everything he eats. Gardening and eating healthy foods are lessons he stresses both inside and outside of the classroom. For the past three years, Balasundaram has been working on establishing a place where youth can come up with innovative ideas and support sustainable food systems. The center will be located on a 10-acre farm in Williamsburg, Virg. where he lived prior to moving to Edwardsville. While maybe not working on as large a scale as 10 acres, Balasundaram hopes to do the same thing in the Metro East area. Balasundaram has plans to use the community garden plot at The Gardens at SIUE for teaching and community engagement. He will also teach the course, “Anthropology of Sustainability” next year. 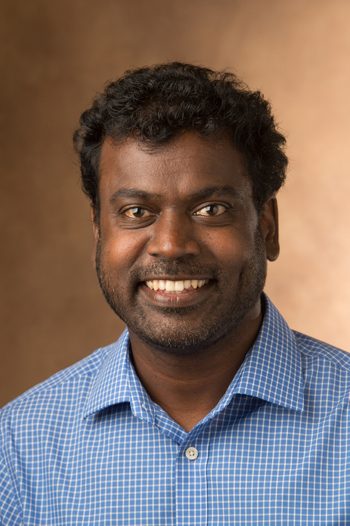 Sasikumar Balasundaram, PhD, assistant professor in the SIUE Department of Anthropology.